Sir Edmund Hillary,88, was rushed to Auckland City Hospital(New Zealand) after a heart attack but passed away this morning at 9 am. He was the great adventurer and humanitarian who set the world's first ever record together with Nepalese Mr. Tenzing Norgay Sherpa to scale Earth's Highest Peak Mt. Everest(Sagarmatha) in 1953. Sir Edmond HillaryRight now, New Zealand is in deep shock and paying tribute to him. He was a hero of New Zealanders and everyone in the country considered him as a role model. He often described himself as a modest guy but we know he is the emblem of great bravery. He ended the debate of who reached the summit first by revealing things in his book 'View from the Summit' where he'd written things which he publicly denied to say. "I continued cutting a line of steps upwards," he wrote. 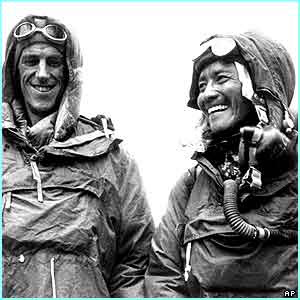 Sir Edmund Hillary and Tenzing Norgay Sherpa"Next moment I had moved on to a flattish exposed area of snow with nothing but space in every direction. Tenzing quickly joined me and we looked round in wonder. To our immense satisfaction we realised we had reached the top of the world." Nepal and Nepalese Sherpas will be always and always grateful towards Sir Edmund Hillary's contributions for whatever he had done good for them, for bringing Rays of hope to poor local people,and for everything he's done with virtuous intentions to uplift the social,economic and education standard of Sherpas. He opened the gate for other westerners. He'll be always remembered and I'm sure, Sherpas and Nepalese are in big grief to learn about this tragic incident, demise of great New Zealander hero Sir Edmund Hillary. May his soul Rest in Peace. it's a sad news.I've also heard this afternoon in news. He was a really nice man! Hope he rests in peace. Tenjing Norgey sherpa took the citizenship of India and started to live in Darjelling. At the time one Nepali leaving his Nepali Citizenship, Hillary(a foreigner) was doing something for Nepalese People.I didn't mean that Norgey did wrong, may his life bounded him to do that. I just wanted say how nice was Hillary. But One thing is asthonising me that why didn't he carry his own country's(New Zealand) flag while climbing the Everest. He took 4 flags, UN, Nepal, India and Britain.I haven't got the answer of it since I knew abt it. umm, this one is really interesting question.. it baffled me too.. I really didn't notice that before.